Gov. 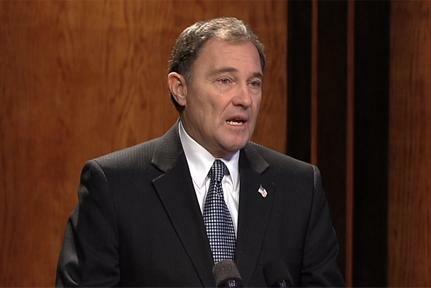 Herbert: "I Am Voting For Donald Trump"
Utah Governor Gary Herbert says he will vote for Donald Trump for president in November. Gov. Herbert told reporters at his monthly KUED news conference that he’ll support Trump largely because of his vice-presidential pick, Indiana Gov. Mike Pence. When asked about some of Donald Trump’s recent statements, Herbert said he won’t be an apologist for the Republican nominee. Democratic nominee Hillary Clinton has begun to reach out to Utahns. In an op-ed published in the Deseret News this week, Clinton mentioned the Governor’s decision to welcome Syrian refugees to the state. “I appreciate the fact that she realizes the positions we’ve taken here in Utah and my positions specifically have been good policy and good positions,” said Herbert. But the governor was quick to point to issues where he and Clinton don’t agree, including economic policy and the use of fossil fuels. He said he’ll stick with Trump. Utah Governor Gary Herbert was the clear winner in Tuesday’s primary election against Republican challenger Jonathan Johnson. 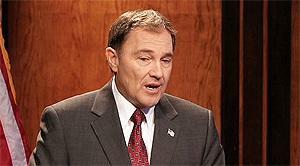 As of late Tuesday night, Herbert led Johnson by more than 40 percentage points. Utah Governor Gary Herbert says he’s glad Tuesday’s caucus meetings were well attended, but that he’d prefer moving back to a presidential primary. Some Utah Republicans Say "Anybody but Trump"
The GOP presidential debate scheduled for Monday in Utah was canceled after Donald Trump announced that he would not participate. As Utah Republicans head into caucuses on Tuesday, the GOP frontrunner is not expected to do as well here as he has elsewhere in the country.